Just Like Bearadise was true to its name. We truly felt relaxed our entire trip. Very thankful for the overall experience. "Just like bearadise" is a beautiful cabin and we had a great time staying there. The surrounding area is beautiful, secluded nature with great views of the mountains. A great value, tons of space, hot tub, gas grill, and could sleep a lot of people. Well located near Bryson City and the entrance to the park. They provide a thorough list of things to do and services in the area. We would highly recommend this and would definitely come back! We had a wonderful stay at Just Like Bearadise. 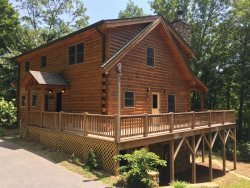 The house was clean and well-equipped, with an incredible view, quiet and remote, and yet only a short drive from Bryson City, Cherokee and Smoky Mountains National Park. We were a group of 8 and 2 dogs, and we were all able to fit fine. The hosts were also helpful for finding the cabin (which was difficult at first). We recommend a day hike in the Smokys, followed by an afternoon in the hot-tub, dinner on the grill and a campfire in the fire pit! The team at Great Smokys Cabin Rental was outstanding the experience was easy and everything was explained in detail had a great experience. Thanks and see you soon! We really enjoyed staying here. Perfect for 3 families. Would recommend this cabin to all our friends. The view was amazing. This was an amazing experience! We were able to escape the city life. The cabin was clean, neat and cozy and very exciting. The view of the mountain from the balcony was something we will never forget. We had a wonderful time in the cabin. We all enjoyed the mountains and can't wait to come back.